While browsing the African American Newspapers database, I came across a short article talking about a Mr. Krehbiel’s recent lecture on “Folk Music. ” Published in 1897, this article caught my eye because the subject matter – folk music in general but occasionally discussed southern black folk music – present was described as “new.” The fact that Mr. Krehbiel was talking about African-American folk music in an educational setting (implied by the text of the article) prompted me to search for more about him. 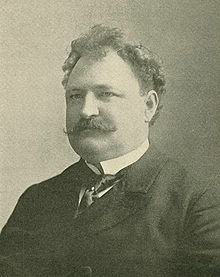 Henry Edward Krehbiel was an American music critic and musicologist who lived from 1854 to 1923. Although he studied law, he went on to become a music critic with the New York Tribune, where he stayed until his passing. For more than forty-three years, he was considered the leading music critic in America, analyzing all facets of music composed in America, including works by Richard Wagner, Johannes Brahms, Antonín Dvořák, Pyotr Ilyich Tchaikovsky (composers he supported before they became popular), and African-American Folk Music. This, in particular, is important as it indicates that Krehbiel was one of the earliest researchers to go beyond recording or transcribing Black folk music and study the characteristics in relation other folk music (Russian, Swedish, etc…). 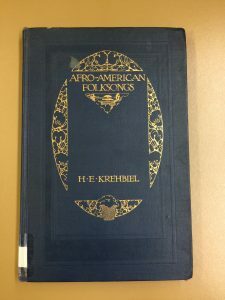 In part, Krehbiel is acknowledging the lack of study on African American Folk Music and, by doing so, is giving it and the black community more credibility than what was not common in that era. When searching St. Olaf’s database, I was pleased to find that the school did own a copy of the (I believe) original book! As mentioned earlier, this book is one of the first scientific studies into African American Folk Music and sought to compare the characteristics (rhythm, intervals, and structure) of that music with folk music of other regions. Returning back to the original article, Henry Krehbiel held lectures on “Folk Music” before and after the publication of this review in the New York Tribune. It is indicated in the text that this article followed the third installment of his “Folk Music” lectures. The significance of thesis lectures, articles, and of Krehbiel’s book is it provides insight into how people first viewed African-American folk music as research began on it. Krehbiel, Henry Edward. Afro-American Folksongs : A Study in Racial and National Music. 4th ed. New York: G. Schirmer, 1914.